Hendricks Chapel Interim Dean Sam Clemence has announced the appointment of the Rev. Gerry Waterman as the new Catholic chaplain at Syracuse University. The appointment, effective Aug. 1, was made by the Diocese of Syracuse and the Conventual Franciscans of Our Lady of Angels Province. Waterman comes to Syracuse from Elon University in Elon, N.C., where he has served as associate chaplain for Catholic life since 2005. At Syracuse, his ministry will support students both at the University and at SUNY-ESF. 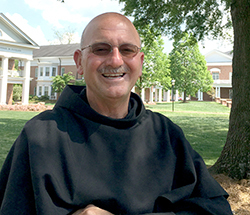 Born and raised in New England, Waterman is a member of the Conventual Franciscan Order and has been a friar-priest for 31 years. He also has served as co-director of the pre-novitiate program and ministered in parishes in New York, New Jersey, Atlanta and in his home state of Connecticut. In his capacity as associate chaplain at Elon University, he led Masses, spiritual retreats, faith-sharing and counseling sessions and annual service trips to both domestic and international destinations, among other duties. The appointment fills a vacancy left at Hendricks after the passing of the previous chaplain, the Rev. Linus DeSantis, last December.